Welcome to part three of my homemade gift ideas series! Last week’s idea, homemade lotion bars, is unisex, so this week’s is a bit more feminine: upcycled fused plastic bag earrings. These earrings are a great low cost project and perfect for the eco-concious girl or woman on your gift list. They’re also a good way to use that cool looking plastic bag you picked up on last year’s vacation and just can’t quite bring yourself to get rid of! I used wooden hoop earring bases, but the tutorial also includes a template you can use to cut your own from cardboard. The most specialized tool you need is a simple household iron, and the main material comes from free with almost any purchase! When I say thick plastic bag, I mean like the type you might get at Ulta or a gift shop – the type of plastic bag that’s noticeably thicker than a regular grocery store bag. Thin bags will shrink too much too quickly and will rip, leaving gaps of wood exposed. Even with a thick bag, it may take some practice to get the technique right. If you’re not happy with your first attempt, rip the plastic off, rewrap the form, and try again! 1. First and foremost, cut your earring bases, if you need to. 2. Fold the bag in half lengthwise and then continue folding it in half until it’s only about 1″ wide. This makes the bag far easier to cut into strips. 3. Cut the bag into uniformly wide strips. I’ve found that strips about 1/4″ wide work best. 4. Heat your iron on its medium-high setting. 5. Wrap the first earring with a plastic strip, as shown. Make sure the wraps overlap because they will shrink! Then, make a second pass around the form so the entire earring has two layers of plastic bag. Use additional plastic strips, as necessary. 6. Place the piece of parchment paper or paper bag on top of the earring and carefully iron it to fuse the bag. This should only take a few seconds, but the exact amount of time needed depends on your bag and iron. I like to iron the earring while moving the iron constantly in a circular pattern for about four seconds, check on it, and then repeat, as necessary. 7. Flip over the earring, protect it with paper, and repeat step 6. 8. If you’re using a wooden form, hold the un-covered earring form against the covered form and line them up. Then use your needle or pin to poke through the visible hole through the hole in the covered earring, as shown below. If you’re using a cardboard form, simply place the earring on a hard surface you don’t mind stabbing in to and make a hole where you want it. 9. Repeat steps 6-8 for your second earring. 10. Place a jump ring in each of the earring holes and press it closed. Then, if necessary, add a second jump ring. Finally, add your ear wires. 11. Wear your new eco-chic earrings or give them as a gift! 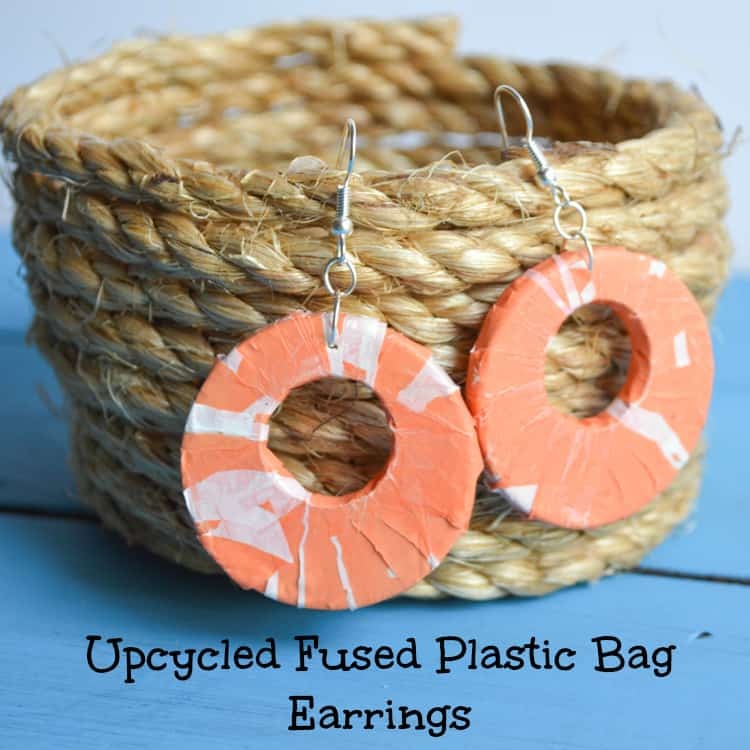 Have you ever tried fusing plastic bags before? It can take a couple tries to get just right, but its really fun once you figure it out! You can actually make plastic ‘cloth’ by fusing several bags together. I’m thinking of doing a second, completely different fused plastic bag tutorial later on. Is that something you’d find interesting? Thank you for the pin! I am so glad Pintrest exists. I love it! You come up with the most creative tutorials! This is so neat and something I never would have thought of! They’re pretty cool! I have several more that I want to do something with.